Banana is a common fruit eaten by all people both children and parents, both the rich and the poor. The delicious taste, filling, rich benefits, and the very affordable price make this fruit a choice for many people. The way of processing also vary, there are directly eaten, fried, boiled, and other types of preparations. There are various types of bananas around us like banana mas, banana kepok, plantain, banana barangan, banana cotton, banana horn, banana ambon, and milk banana that will be discussed in this article. Banana milk is one type of banana that has a small enough size similar to banana mas. This banana can be recognized from its thin skin and is yellow in black specks. When peeled will look fleshy yellowish-white fruit with the aroma of the fruit is fragrant and sweet. For athletes or banana athletes is a must-eat food. The content of potassium in milk bananas is very good to help muscle contraction and prevent muscle cramps. This is certainly very beneficial for athletes who often use and train their muscles. Potassium contained in milk bananas is very useful for blood circulation so that it can prevent us from various diseases such as heart and stroke. Banana milk can be used as a source of good energy for the body. Carbohydrate content is easy to process and can help launch metabolism so it can be a source of energy for everyday activities. In addition, bananas also contain natural sugar of glucose, fructose, and sucrose is very good to restore stamina. Amino acids in bananas can also help burn fat in the body into a source of energy. Milk banana is also a very good food for digestion. The fiber content can help the intestine work in absorbing nutrients to the fullest. In addition, the carbohydrate content is also more easily processed into energy by the body than other types of carbohydrates so as to smooth the process of food absorption. For those of you with hypertension or high blood pressure banana milk is the right food for consumption. High potassium levels and low sodium content are suitable for hypertensive patients who require high amounts of potassium but should limit the consumption of sodium. Diarrhea can cause the body to lose much fluid and electrolytes. For that required fluid and electrolyte intake as well as foods that are easily digested and help to thicken the stool. One of them is a milk banana. High potassium content in milk bananas can help restore lost body electrolytes. In addition, bananas are also easily digested and become a source of energy. One of the important nutrients in the benefits of milk bananas is a useful iron content in the formation of red blood cells. This makes bananas as the right foods to prevent and overcome anemia or red blood cell deficiency. Infants aged 6 months and over have started to be taught to eat foods other than breast milk. For that one of the right foods given is a milk banana. Soft texture is perfect for babies who do not have teeth and digestive organs are still not perfect. Plus a natural sweetness suitable given to the baby to introduce new flavors in infants. In addition to having a soft texture and a natural sweetness, nutritional content in bananas both vitamins, minerals, and fiber is very good to support the growth and development of infants such as energy sources, digestion of infants, bones, eyesight, and prevent infants from diarrhea. Milk banana is one of the most sought after fruits by pregnant women. The content of folic acid is very good for the development of the fetus in the womb. But the consumption also should not be excessive because of the high calorie content in milk bananas. Should be adjusted to the content of pregnant women and calorie needs. Some pregnant women, especially young pregnant women experience nausea and vomiting, some are mild and some are severe. To overcome this we can also take advantage of milk bananas. 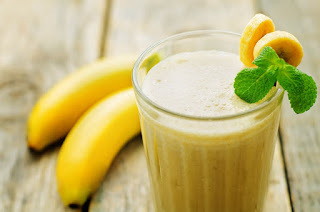 How to make banana milshake mixed with honey that can reduce the nausea. With the addition of honey on banana milshake drinks can also help increase blood sugar levels. This is very beneficial for pregnant women who experience severe nausea and lack of appetite. If you are on a diet program then banana is the right food as one of the daily menu. With the right portion of bananas can be a source of energy and calories are healthier. High fiber content makes you feel full longer so it can suppress the appetite. Patients with stomach acid or gastritis are required to be careful to keep food either at meal time or type of food consumed. One of the right foods for people with this disease is milk bananas. This is due to its soft texture and its ability to neutralize stomach acid and reduce irritation of the intestine. Which must be considered to consume milk bananas that are ripe and taste not sour. In addition to healthy bananas are also often used as a face mask. The use of a banana mask on a regular basis can help lift dead skin cells on the face so that the face looks more radiant. It also can make the face more smooth, fast, and bright. Apparently there are so many benefits that we can get from eating milk bananas. To get all the benefits above there is a good banana milk consumed directly and selected that is perfectly cooked and in good condition.